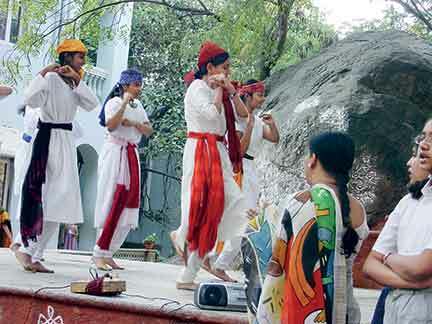 Drama has been an integral part of curriculum and instructional strategy at Vidyaranya High School. Students participate as actors, while the language teachers write scripts and direct these whole class dramas. An unspoken rule is to include every child in a manner that he gets to play roles and deliver lines that help to hold the storyline together. This inclusive principle creates a climate of friendliness and keeps every child cheerful while behaving responsibly during rehearsals and the hour-long stage show. After numerous rehearsals, the teacher and students decide the date to stage the play for an audience consisting of parents, siblings, and grandparents of the actors. About 120 people are seated on chairs in an open-air theatre within the precincts of the school. While props are avoided, actors emote them wherever possible. Music, including instrumental music, is provided by the actors present on the raised stage or by those waiting in the flanks. Neither curtains nor mikes are used. This simplicity of the final day’s stage and audience arrangements frees up teachers and students to focus their attention on developing student competencies during the rehearsals. Appropriate pace of articulation, tone of voice, and simultaneity of emotion in speech and action are some aspects that are carefully monitored. The advantages of developing classroom drama are many. Children get to practice listening and speaking. Every child gets to participate irrespective of disabilities or special circumstances or her academic standing. While individual as well as collective responsibility and collaborative spirit are instilled, fear has no place. As any other young new teacher, firstly I surrendered my teaching periods as and when required by a senior colleague, secondly I provided suggestions to the group, and thirdly helped with lowering noise levels inside the classroom. In the year 1995, I attended a week long ‘Children’s Theatre Workshop’ for schoolteachers and post graduate theatre students conducted by Stephan Ecklat at the Max Muller Bhavan in Hyderabad. Stephan, a professional theatre person from Germany, put us 20 participants through numerous interesting exercises for about 52 hours. Thereafter, on the last day we went round the large campus discussing many mini storylines and zeroing on individuals who would play specific characters at different spots. We did act out some parts at a couple of spots, but that was it for a rehearsal. That evening, we went into action on stage before an invited audience. The distinguished guests deservedly applauded the group and Stephan for the sheer creativity displayed during the show. Back at school, I had enough time to reflect over the many new techniques learnt during the workshop and to try them out inconspicuously in my class. The next year, I chose to stage Safdar Hashmi’s long poem ‘Raja aur Saadhu’ that had only two characters but plenty to emote and modulate with voice. Rehearsals started about two weeks before the D-day. On day one, all the lines were apportioned among the 25 children. During the next two days, children faltered on their lines but as time passed, every child had the whole long poem by-heart. The group spent about five days in learning to modulate voice, add action, and importantly, to throw their voices far enough to reach members of audience sitting about 20 feet from the actors. This was the time for improvisations. Half of the class was to play the raja and the other half played the saadhu. Everyone had to take care that only one voice was heard at any given time. After saying one’s lines the child playing raja Akbar ceremoniously passed on a beautiful ‘pagadi’ to the head of the next child playing Akbar, whereas Birbal masquerading as a sadhu was signified by a ‘rudraksha mala’ that was passed down the Birbal players’ line. The above is a description of the simplest improvisational play developed in my class. Despite many children playing the two characters, the seamless discipline maintained in dialogue delivery and while taking and giving charge, left the story line impressed in the minds of the audience. For six consecutive years, groups of students worked on improvising plays. Children always knew the story before they started working on the play. We broke up the story into parts, worked on actions and verbal expressions in groups or individually. Let others within the group improve upon our work many times over: added, removed, or changed lines or scenes. Yet no one wrote the script. This period of improvisation always made the classroom energetic and chaotic: but unfailingly, a complete story emerged in a drama form. Some of the stories changed to such an extent that knowing audiences questioned the need to announce the credits to authors. One batch of my students worked on Rabindranath Tagore’s ‘Story of a Parrot’ and presented it to parents in the form of a street play. The moment I cherish is the one when all children pointed in unison, at the tiniest child in class to signify their decision to assign the parrot’s role. While almost every child had contributed to building this character during improvisations, this little boy had brought great emotion and accurate movements to it. That child, at ten, was, academically speaking, years behind the class. His parents worried much about his progress because he was prematurely born. As years rolled by, it became apparent that improvisational drama prepared students on many more aspects of learning than any instructional techniques I had known until then. However, the teacher with a simple B.Ed degree had no means to explain the strengths of whatever was happening in her class. She had to be content with the applauds of impressionable parents. Later, during my study for a master’s degree, our class was asked by Dr. Donna Russell to critique an article titled, ‘Beyond Bloom’s Taxonomy: Rethinking Knowledge for the Knowledge Age- Developing Higher-Level Approaches to Knowledge’ by Carl Bereiter and Marlene Scardamalia, Ontario Institute for Studies in Education of the University of Toronto. While thinking over the article I realized that the technique of improvisation had enabled my students to function at the top, i.e., the 4th, 5th, 6th, and the 7th levels of objectification of knowledge. They were ‘able to view knowledge from different perspectives. They knew they were constructing knowledge. They treated knowledge as an improvable artifact. That they could relate to, use, manipulate, and judge knowledge in various ways’. While studying the Bloom’s Taxonomy of Cognitive domain I realized that the improvisational technique had made my students operate consistently at the level of application. Students had used their knowledge and understanding in a similar problem situation while they were involved in changing a story into a play. As for the learning on the affective front, as espoused by Krathwol, my students had passed through the stages of receiving, responding, valuing, organizing, and ultimately attained characterization by persisting with their interest and application of their skills over many months. While reading about the importance of ‘zone of proximal development’ and ‘scaffolding’ I could not stop appreciating the advantage that my students had gained through the participation of different teachers and parents during the development of improvisational drama. These adults with varied experience bases worked in the presence of children transparently and participatively while carrying out the processes of analysis, evaluation, and synthesis that were needed to transform a little story into a one-hour long drama. We adults were all involved in modelling, coaching, and scaffolding during the improvisations and the rehearsals. Teachers in higher classes were, generally speaking, happy with the high level of interest that my students demonstrated in the Hindi language. Their articulation and grammatical sense were fine. While students came to my class with good reading skills, I could have devised writing exercises based on improvisations. Even so, there were times when the high interest levels among children converted to self-assignment of written work and never before was the homework done, as well! Another tool that illustrates the meaningfulness of improvisational drama as an effective tool is Jonnasen’s eight-pointed tool that lists the characteristics of meaningful learning. Jonassen (1996) proposed that learning environments should be active, intentional, complex, contextualized, reflective, conversational, collaborative, and constructive. This framework accounts for all the other aspects of learning that my students had experienced through improvisational drama. Improvisation is about not repeating anything as it stands but to rework on it in a purposeful manner. Drama helps in practicing varied forms of skills required by students in their lives. Together, improvisation and drama could create a powerful constructivist-learning environment away from tedium. Teachers wishing to lead their students on to the path of higher order thinking need flexibility to adopt instructional techniques that accommodate complexity. Our knowledge of the theme that we wish to explore in class should be deep and wide enough. A confident, disciplined, enthusiastic, flexible teacher attitude can lead our students on to a path of excellence. Here are a couple of situations you can try to improvise in your classroom. If you are a math, science or a social studies teacher help students by adding to these situations, aspects of problems, or topics that you want learners to engage with. Characters: A kirana shop owner and a customer with a couple of family members. Situation: Interaction starts from the time the customer enters the shop and ends with the customer and family moving away from the shop. Characters: A lion trapped in a net, a group of mice led by a leader, a flock of birds led by their leader. Situation: Stage the later part of the folk tale. Show that at least two characters use mobile phones to communicate with other characters for resolving the problem that they are faced with. Bereiter Carl and Scardamalia Marlene. Beyond Bloom’s Taxonomy: Rethinking Knowledge for the Knowledge Age-Developing Higher-Level Approaches to Knowledge, Ontario Institute for Studies in Education of the University of Toronto. The author, a former teacher, is now an independent learning consultant and architect. She can be reached at bhidepoonamd@yahoo.com.